Will Trump wipe out Obama’s opening to Cuba? Photo illustration by Derreck Johnson. Images via Chip Somodevilla/Getty Images and PeterHermesFurian/iStock. This is the fourth in a series of posts looking at how Donald Trump’s presidency could impact countries and regions around the world. The thing about Obama’s “deal” with Cuba is that there actually is no deal. There’s an ongoing diplomatic process involving talks on dozens of issues and a number of changes to regulations and diplomatic policy. So where does our president-elect stand on all of those? 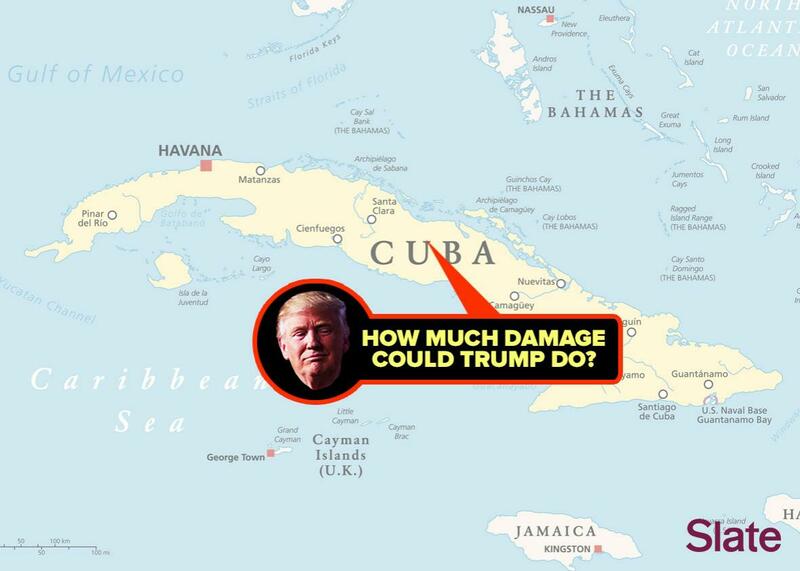 Even by Trump standards, he’s all over the map on Cuba. During the GOP primary last year, Trump told the Daily Caller that although he thought he could have gotten a better deal from the Castro regime, the Obama administration’s diplomatic opening to Cuba was “fine” and that, referring to the longtime U.S. embargo, “50 years is enough.” This echoed the language used by opponents of the U.S. embargo on Cuba, in place for more than five decades, and put Trump at odds with opponents like the Cuban American Sens. Marco Rubio and Ted Cruz and former Florida Gov. Jeb Bush—all pro-embargo hardliners. Perhaps this was because, as Newsweek reported, one of Trump’s companies may actually have done business in Cuba in 1990s, despite the embargo. Campaign talk is cheap of course, but even before Castro’s death, Vice President–elect Mike Pence vowed that Trump would follow through on his pledge to reverse Obama’s executive orders on Cuba. Some Cuba-watchers I talked to also pointed to the naming of hardline anti-Castro activist Mauricio Claver-Carone to Trump’s economic transition team as evidence that the next president may have meant what he said (the last time, anyway). Like many of Obama’s diplomatic achievements, the opening to Cuba that began in December 2014 was accomplished through executive orders, without the approval of Congress. (The embargo itself will remain in place until Congress acts to lift it.) So Trump is correct when he says that he can “terminate” it all. There’s precedent for this: Jimmy Carter lifted most of the travel ban in 1977, a move that was reversed in 1982 with Ronald Reagan in office. If Trump wants to, he could put Cuba back on the state sponsors of terrorism list, reimpose the restrictions on travel and commerce in Cuba that were eased under Obama, and once again shutter the U.S. Embassy in Havana that was reopened with much fanfare in August 2015. While Fidel remained an active and influential presence in Cuban politics, he ceded power to his brother in 2008, and his death is unlikely to lead to any immediate political changes in Cuba. Cuba is likely to continue the very slow economic liberalization and even slower political opening that has been taking place under Raul. The younger Castro brother is leaving the presidency in 2018, and there’s little evidence to suggest that he or his successors are open to major political transformation. But Trump’s initial skepticism was correct: 50 years of isolation did little to weaken the Castro regime’s hold over the island or increase political freedoms for Cubans. If he does return the U.S. to the more hostile posture toward Cuba it had prior to Obama, the goals outlined by Priebus would be even harder to achieve. “There’s been a fairly public debate about whether or not Obama’s policy is sincere,” says William LeoGrande, a professor at American University and expert on the U.S.-Cuba relationship. Cuba’s recent political and economic openings are very limited and tenuous to begin with but could quickly be reversed if tensions with the U.S. return to their previous level. “They will close down some of the political space that’s opened up in the last couple of years, they’ll get tougher on dissidents and start sending them back to prison, they’ll start using nationalist appeals to rally support for the regime, and they’ll go back to blaming the economy on the United States,” says LeoGrande. Trump may not care that much about any of that, but there’s still reason to be believe he might not actually follow through on his threat to resanction Cuba. “Only a cold warrior would do that—someone with deep ideological convictions against the Cuban regime,” notes Shifter. And Trump’s fondness for dictators such as Vladimir Putin and Bashar al-Assad doesn’t suggest human rights are going to be a major priority of his foreign policy. Also, if we assume, as evidence so far suggests, that Trump intends to use U.S. foreign policy to advance his own business interests, then locking down Cuba makes little sense. “He’s a hotelier and a golf course developer. And that’s prime real estate,” says Chris Sabatini, a lecturer at Columbia University and editor of the website, Latin America Goes Global. A rollback would also be opposed by the American companies, from JetBlue to MasterCard, already doing business in Cuba under the new rules. It also wouldn’t be that much of a political winner. Trump did win Cuban Americans in Florida, but by a lower margin than Mitt Romney, and the trend lines suggest this constituency is no longer a reliable Republican stronghold. A majority of Americans, including Cuban Americans, supported Obama’s moves on Cuba, and the staunchest defenders of the embargo in Washington, such as Rubio and Congresswoman Ileana Ros-Lehtinen, aren’t exactly die-hard Trumpians. Most likely, Trump’s sudden focus on Cuba is driven by the news cycle, and the issue won’t ultimately be high on his agenda. Trump seems unlikely to help bolster Obama’s legacy by continuing the opening, as Hillary Clinton might have, but it would also be surprising if he made facing down Raul Castro a major priority. How Much Damage? Iran Edition. How Much Damage? Syria Edition. How Much Damage? East Asia Edition.